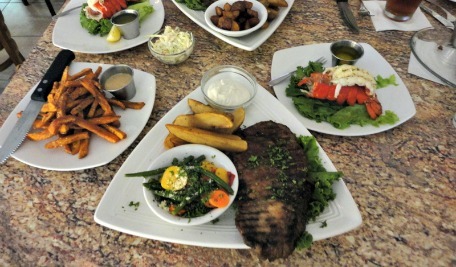 Lobster Lady is Cape Coral's fantastic seafood restaurant, selling and serving fresh lobsters, seafood, steaks, and sandwiches in their very chic bistro and market. We had the pleasure of dining there recently and the food was just awesome! 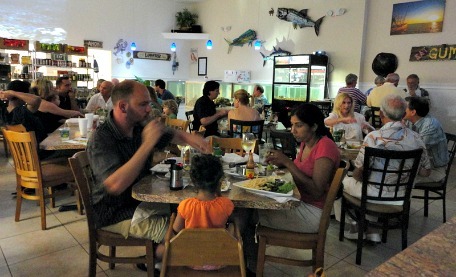 Seafood is picked up 6 times a week to ensure freshness to this family owned and operated Cape Coral restaurant. Everything is fresh, fresh, fresh! 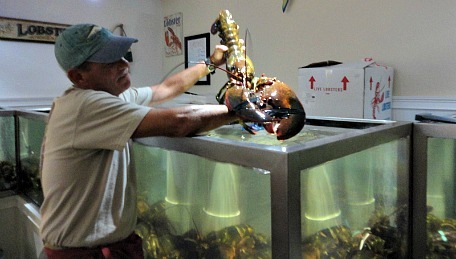 Lobsters are flown in from Nova Scotia and picked up once or twice a day from the airport. Ipswich clams come fresh from Massachusetts, scallops from New England, and grouper from Pine Island. Because they buy such a volume of lobsters, it may be less expensive to have lobster dinner at Lobster Lady than from Publix! Owners Mary Beth and Chris buy so many lobsters because they also sell lobster machine games. The games are sold around the country and are a sort of vending machine that is similar to those crane games where you try to pick up a stuffed animal or toy, except you play for lobsters. 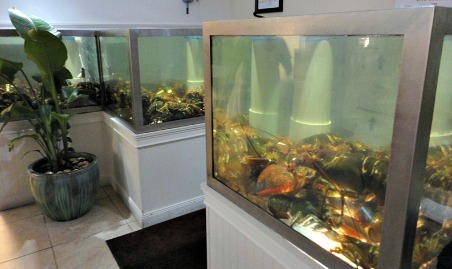 You can play one of their games at the restaurant, but what I'm fascinated with are the lobster tanks, and yowzah ....... there are some huge ones in there. This bad boy is 15 pounds! 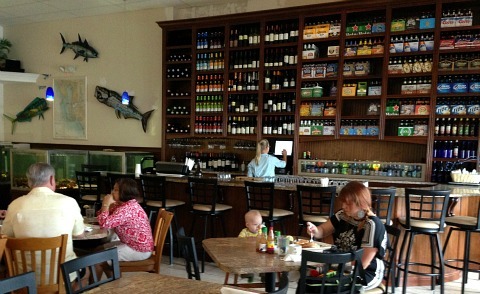 The restaurant has a cool, contemporary groove, and is lined at one end with a case displaying all their seafood. Above the case, seafood market specials that you can have prepared the way you like. They are displayed on the wall by a projector that switches back and forth to a list of the daily dinner specials being served. Next to the specials is a screen wrapping around the corner with images from Deadly Catch episodes and other TV shows flashing across, adding to the artwork on the walls. Seating includes tables and high tops inside, and cafe tables outside. We couldn't resist the Cajun Prime Rib with Lobster Tail. The lobster tail was cooked to perfection and the prime rib was the best I've ever had. Beer and wine are available as well as sodas, iced tea, lemonade, and coffee. 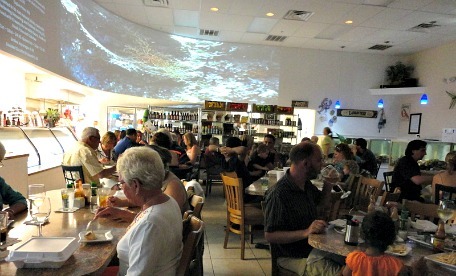 Lobster Lady has live music Sunday and Tuesday nights and daily food specials. For the specials, Mondays feature sushi, Tuesdays snow crabs, Wednesdays are a surprise, Thursdays Grouper Finger Baskets for $12.95, Fridays Prime Rib and seafood specials, and Saturdays Cajun Prime Rib. Pacific seafood specials such as Wild Alaskan Halibut and Wild Alaskan King Salmon, are new additions to the menu. The restaurant is so popular, you may have to wait even on a weekday, off-season. Now I know why ......... we had such an enjoyable time with great ambience, delicious food, and friendly service .......... the market is open daily from 9AM-10PM. The bistro is open from 11AM-10PM during the week, and they are now open for breakfast on Saturday and Sunday from 7AM-2PM. We also tried their Seafood Gumbo, which was delicious and had the right amount of spiciness from the Andouille sausages. Other items on the menu are various seafood appetizers, soups, salads, raw bar, seafood baskets and entrees, Black Angus steaks, chicken and pork selections, seafood sandwiches, and desserts. Mary Beth and Chris know that each state in New England has their own special way of preparing Lobster Rolls, so let your server know how you like yours made and they will be more than happy to accommodate you and customize any seafood or meat dish. All dinners are available fried, grilled, blackened, sauteed, or baked with lemon butter or brandy butter sauce with a choice of two sides. They can also bronze, or stuff, serve over linguini in an alfredo, fra diavolo, vera cruz, or scampi sauce ....... if they have the ingredients, they will create whatever you like! Go for their excellent breakfasts on Saturdays and Sundays from 8AM - 2PM. Mmmmmmmm ............ 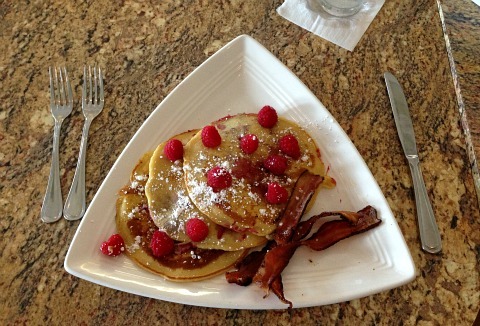 I really loved their Raspberry Pancakes. 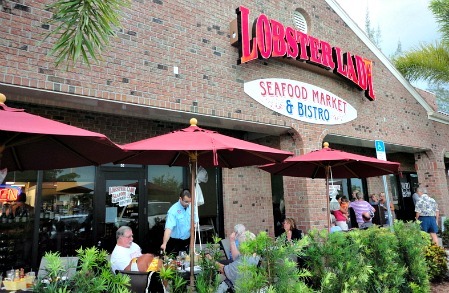 Lobster Lady has been added to my list of favorite Cape Coral restaurants and I'm dying to go back so I can try their Bacon Wrapped Salmon, Lobster Pot, Grouper, Crab Cakes, and maybe the lobster game. Try their brand new raw bar!